The 2014 WAEC GCE result is out according to The Head, National Office of the Council, Charles Eguridu. 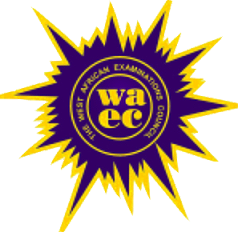 The West African Examinations Council (WAEC) has officially announced that her 2014 WAEC GCE Nov/Dec results are now accessible online. Participants can now check their result online from WAEC result checking portal. Although, you can encounter difficulty in checking your 2013 WAEC GCE result due to the number of traffic the website is receiving. If you’re unable to check it now, you can try checking it at night when the traffic will be less. Check WAEC GCE Result Online. 1) Buy WAEC result checking scratch card from any Banks or Authorized Dealers or any WAEC office nearest to you. 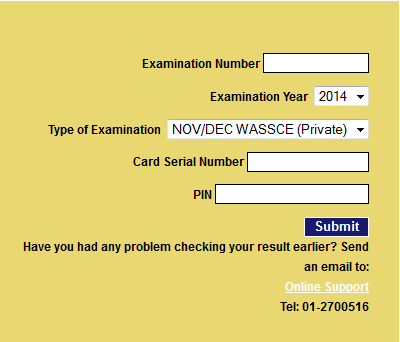 2) Go to WAEC official result checking portal @ www.waecdirect.org. 3) Now supply all the required information in the appropriate space, such as : Examination Number, Examination Year, Type of Examination, Card Serial Number and PIN. 4) After supply all the relevant information in step 3 above, finally click on the submit button to view your 2014 WAEC GCE Nov/Dec result. In conclusion, we advice all students to send their WAEC GCE result to their email since the maximum number of time they can use their result checker is 5 times. You can easily send it to your email address by click on the Send Result to Email button on the result page. 2014 WAEC GCE Result Statistics. Over 70 percent of students who sat for the 2014November/ December 2014 West African Senior School Certificate Examination (WASSCE) failed. They failed to make five credits, Mathematics and English Language inclusive, according to the exams body. To pass the exam, one has to have five credits with the two subjects. WAEC HNO Charles Eguridu , revealed that out of the 241,161 candidates who sat for the exams only 72,522 scored five credits with the two key subjects, giving a pass rate of 29.27 percent.